Cigarette smoking is a leading risk factor for morbidity and premature mortality in the United States, yet information about smoking prevalence and trends is not routinely available below the state level, impeding local-level action. We used data on 4.7 million adults age 18 and older from the Behavioral Risk Factor Surveillance System (BRFSS) from 1996 to 2012. We derived cigarette smoking status from self-reported data in the BRFSS and applied validated small area estimation methods to generate estimates of current total cigarette smoking prevalence and current daily cigarette smoking prevalence for 3,127 counties and county equivalents annually from 1996 to 2012. We applied a novel method to correct for bias resulting from the exclusion of the wireless-only population in the BRFSS prior to 2011. Total cigarette smoking prevalence varies dramatically between counties, even within states, ranging from 9.9% to 41.5% for males and from 5.8% to 40.8% for females in 2012. Counties in the South, particularly in Kentucky, Tennessee, and West Virginia, as well as those with large Native American populations, have the highest rates of total cigarette smoking, while counties in Utah and other Western states have the lowest. Overall, total cigarette smoking prevalence declined between 1996 and 2012 with a median decline across counties of 0.9% per year for males and 0.6% per year for females, and rates of decline for males and females in some counties exceeded 3% per year. 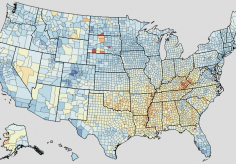 Statistically significant declines were concentrated in a relatively small number of counties, however, and more counties saw statistically significant declines in male cigarette smoking prevalence (39.8% of counties) than in female cigarette smoking prevalence (16.2%). Rates of decline varied by income level: counties in the top quintile in terms of income experienced noticeably faster declines than those in the bottom quintile. County-level estimates of cigarette smoking prevalence provide a unique opportunity to assess where prevalence remains high and where progress has been slow. These estimates provide the data needed to better develop and implement strategies at a local and at a state level to further reduce the burden imposed by cigarette smoking.